Drive Links/Bar Length 60DL - 16"66DL - 18"68DL - 18"70DL - 20"72DL - 20"84DL - 24"/25"87DL - 26"91DL - 28"93DL - 28"98DL - 30"105DL - 32"114DL - 36"115DL - 36"135DL - 42"156DL - 52"168DL - 56"185DL - 62"210DL - 72"
The Forester Ripping Chain was developed for cutting with the grain when attempting to "rip" a tree. 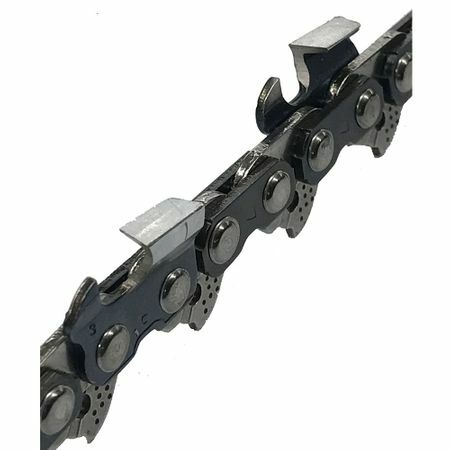 The teeth on a ripping chain are sharpened at a specific angle to be able to discharge the elongated wood chips that happen when cutting with the grain to help reduce the "clogging" affect. Ripping chain 3 I used this ripping chain today. I cut 25 lineal feet of a 30 inch log. I have riped logs faster with cross cut chains. I'll cut the rest of that cherry log with a crosscut tomorrow, but I'd bet it will do better. If so, I'll re sharpen the rip chain to a 30 degree angle and use it as a crosscut. Pros:It was cheap. It's just a crosscut chain sharpened at a 10 degree angle. I can still use it as a crosscut. Cons:I had to remove a drive link to make it fit my bar. Nice chain 5 Works well in mesquite if you have a high power saw 50cc up or it will bog your saw. Pros:Very affordable compaired to other brands. Rip chain 5 The chain milled through the logs like butter!